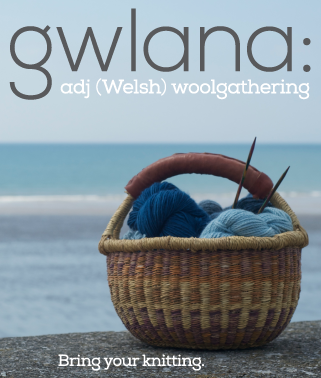 In this episode: This week I scour the internets for the perfect winter sock yarn, and find it in the Welsh countryside, ten miles from where I live. There’s a bit of musing on the merits of sock laundry, which leads me to discover the joy of knitting socks in pure unadulterated animal fibre. I talk a great deal about Stephen West’s sweater pattern, Enchanted Mesa, the crisis of confidence I’m having with mine, and the beautiful examples of the sweater I’ve found on Ravelry. Here are links to some of my favourites: HookedupKnits Enchanted Leftovers; Vischilover’s Enchanted Mesa-2; tma’s Enchanted Mesa. As I copied and pasted these links, and saw all the beautiful sweaters on Ravelry, I think I”m over my crisis. I’m going to keep working on this, because it’s going to be awesome. 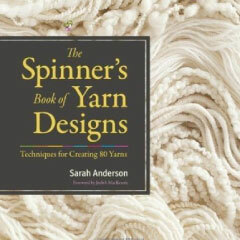 I also visit with spinner and teacher extraordinaire, Sarah Andersen, whose book The Spinner’s Book of Yarn Designs: Techniques for Creating 80 Yarns, I raved about in the last podcast. You can find Sarah online at and in her Ravelry Group, Serial Spinners. Sarah will be teaching at Fibre East, the 26th and 27th of July, in Ampthill, Bedfordshire. If you haven’t already registered for this event, you should think about doing that soon. Fibre East is shaping up to be a world class UK fibre event. I talk a great deal about the Babylonglegs yarn I’ve slated for next week’s give-away, forgetting that it was supposed to be Malabrigo next week. So that’s confusing. Let’s clear that up, shall we? I’m sticking with the Babylonglegs, as that’s the yarn I bigged up this week. NEXT WEEK, I’ll give away Malabrigo. I probably talked more about my office remodel than you wanted to hear about, but what the heck, eh? I’m excited. From next week I’ll be blogging the remodel project. I may have also gone on for too long about Eurovision, but hey, it’s my FAVOURITE TV EVENT OF THE YEAR! If you don’t know by know how very much I love and look forward to Eurovision, I’m afraid we can’t be friends. I spent far too much time making a set of six Eurovision Bingo Cards this week. Why not download my Eurovision Bingo Card, and play the home version! I will be live tweeting the event, of course, as I do every year. You can follow my tweets here. You can sign up for mailing list using the form in the sidebar, or by clicking here. 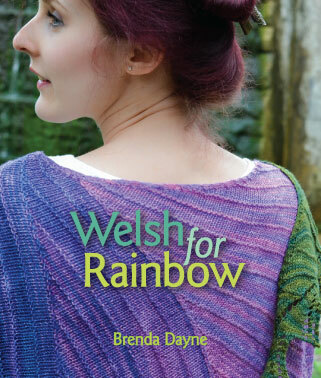 You’ll find me hanging out on Ravelry in the Brenda Dayne Fan Club. Dustin the Turkey, Ireland’s entry for 2008, is a fabulous three minute sour-grapes drag screed about the unfairness of Eurovision voting, included a demand for “douze point”, the highest possible score from every country. I think it was meant in fun, but… it did not go down well with the crowd. This 2007 entry from Ukraine tops my list of Best Batshit Crazy Eurovision Song in the History of Everything. This. This is why I watch. Music by Bill, Sound Scientist, from the cd Birthday Suit; Katy Fpaffle, As She Stands from the cd of the same name;Domenico Modungo, 1952 Eurovision winner, Volare. Brenda , your Bingo cards are absolutely brilliant . best wishes for a hilarious Eurovision ! Great episode. I wish my wheels weren’t in storage from my recent move. also, it looks like I should get on board with Eurovision! I curled up at the local coffeeshop with a mocha, put in my earbuds, frogged some lovely yarn that was misbehaving in the pattern I was using it for, re-cast-on in the proper pattern, and then let you talk into my ears for an hour. Pure bliss. Thanks for coming back to podcasting. You are the best. Lovely episode, thank you. Enjoyed the music in this one. Great interview too, will need to have a look at this book when at home. Beautiful work! Of course I love the wonderful field recordings book-ending your trips to and from the car (sometimes even with cider) to record the ‘cast, and the sonic glimpses of your home just now with all the springtime birdsong! I felt I could hear the sunshine. Lovely to hear how enchanted mesa has gone since we went through your stash for it in January, and I love knitting with breed specific wool for my feet, so very happy to hear about the Ystrad organics socks! Thanks for the shout out. 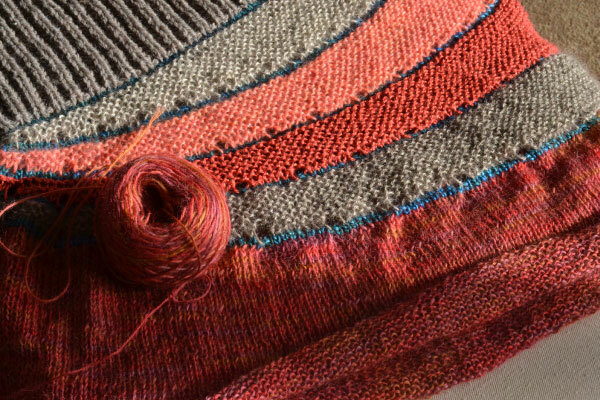 I was just now knotting and tidying steeks to a big pile of swatches for The KNITSONIK Stranded Colourwork Sourcebook, and listening to your wonderful voice, so it was a nice surprise for you to congratulate me in the ‘cast. Thank you so much. Before we were friends your podcast was my companion during many late night creative projects, and I love that this continues. But it’s even better now that I recognise the specific timbre and tone of your gate latch in your audio, and that the birdsong reminds me of hanging out in your garden with you and Tonia, knitting, yapping, and caning ginger beer. You are the best. I cannot wait for Eurovision which you have massively improved for me with your wonderful bingo cards invention. Great episode. If the car is good enough for Dr. Gemma! You kept me company on a crowded and long flight home from London to Vancouver. I saw your plinth! Love it when you make Tanya laugh! Thank you Brenda for a wonderful podcast! I will admit I slept thru it the first time but totally enjoyed the second listening, your voice is so soothing even for an insomniac like me! I too loved the Carcast, Tanya and you chatting on the way to the car, the music, stories… oh just everything, so happy you found your podcast voice again! I can relate with the SW sweater, while it might look cool on youngsters I am sure I would never wear the thing! I have enough hard time with odd shaped shawls, can’t imagine a sweater! The “Join” button to enroll in the email list isn’t working for me. Help? Lovely to hear you again, knit-twin! It never occured to me to tell you until now, but your podcast is so important to me. When my anxiety rises, generally during grocery shopping, I shut down in the car and concentrate on your podcast. How appropriate for me that you recorded in your car 🙂 I have my favourite episodes in my phone. Your podcast is the best. Thanks for helping me to paint my fence 🙂 Listening to you chatting about knitting made the painting task bearable, while also encouraging me to get on with it so that I could get back to my knitting! You’re a star – thank you!